Still far from home after escaping slavery in the icebound land of Skandia, young Will and Evanlyn’s plans to return to Araluen are spoiled when Evanlyn is taken captive. Though still weak, Will employs his Ranger training to locate his friend but soon finds himself fatally outnumbered. Will is certain death is close at hand, until Halt and Horace make a daring last-minute rescue. 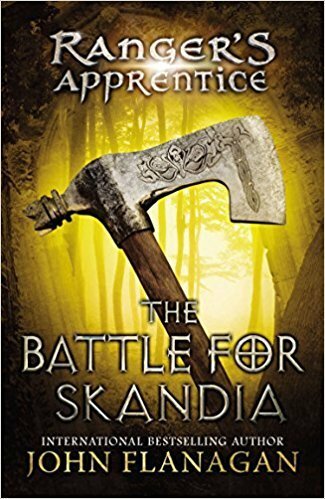 But their reunion is cut short by the horrifying discovery that Skandia’s borders have been breached by the Temujai army – and Araluen is next in their sights. Only an unlikely union can save the two kingdoms, but can it hold long enough to vanquish a ruthless new enemy? I enjoy this book better than the third book in the series. I like this as a mindless read especially since my brother talked me into reading these. I am like them as a relaxing summer read when I am not in the mood for nonfiction. I think these are good reads for teens/tweens who love this type of books that are fantasy, medieval type of story.